Marissa Nielsen is an accomplished three day eventing and jumper rider and trainer. She is very experienced with teaching all ages and levels from beginner to advanced. We focus on eventing, but teach dressage and jumpers and start young horses in all disciplines. Give us a call and see what we can offer you to get you to that next step, whether it’s riding at home, for fun, or serious show competitions we have something for everyone! Marissa has just relocated from the Bay Area and is now accepting new clients and horses in training. Sandy is a Bronze, Silver and Gold Medalist and is certified by the Swedish National Riding School in Strömsholm through an extensive three year program. She spent a year in full training with Olympic Gold Medalist Gabriella Grillo in Germany and has always followed the path of classical dressage. Her 12 years of European experience gave her a strong understanding of how important the basics are for both horse and rider. Under her tutelage, Sandy has helped dozens of riders achieve their USDF medals, including several gold medals. Full and partial training programs are offered as well as lessons and clinics off site. Horses and riders of any age are accepted and programs are tailored to everyone’s specific needs. Sandy has a lesson horse available and can also help you find your new equine partner. Practically born on the back of a horse Sharon began her riding career with a pony that her parents bought for her at age two. At age ten she began riding hunters and jumpers. Not long after she began showing she developed a special love for the jumper arena. Her parents decided it was time to invest in a jumper type horse that she could show. They bought her a running quarter horse named Bootlegger Beau. Together they won multiple championships on the A circuit, SAHJA awards, and Nor Cal championships. In her early twenties Sharon moved to San Diego and was able to ride under top Grand Prix trainers. Sharon was also fortunate enough to ride under notorious clinicians such as Linda Allen, Richard Spooner, and Bernie Traurig. 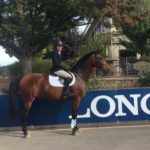 After riding on the show circuit in Southern California Sharon decided she wanted to try another avenue of equestrian sports and turned her interest to Endurance Riding. She was hired on at an endurance breeders facility to start the young prospects under saddle. Sharon loved the new challenges and education that endurance riding brought to the table and entered the Western States Tevis Cup 100 mile endurance ride in 2013 and finished. ​Today, Sharon Schmidt Training focuses primarily on her first love of competition in the show ring. She has brought many students success in competitions, and has paired students up with horses that together make winning teams. At Sharon Schmidt training she not only teaches riding fundamentals and how to be successful with your horse, she also teaches her students to have good sportsmanship and what being on a team is all about.